This image shows an area 1.77 x 1.18 deg. in the constellation Cepheus. Here is a bit of confusion with the catalogue entries of the objects (see annotated mouseover). NGC 7129 was discovered in 1794 by William Herschel with an 18.7-inch f/13 speculum telescope. He described it as "three stars about 9m involved in nebulosity. The whole takes up a space of about 1.5' diameter; other stars of the same size are free from nebulosity." 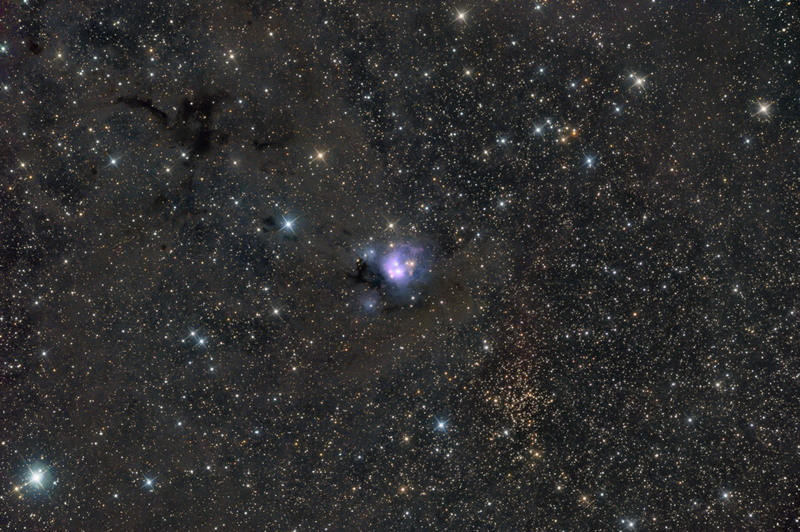 Some astronomers consider NGC 7129 an open cluster, and IC 5134 - the wide dusty nebula around this cluster. Others (e.g. Magakian 2003) believe IC 5134 to be the detached part of the whole nebula. According SIMBAD, Collinder (1931), DAML02 and Archinal&Hynes (2003), NGC 7129 = Ced 196, DG 176, Cl Collinder 441, C 2140+658, Small Cluster Nebula, IV 75, h 2131, GC 4702; and IC 5134 = Ced 196, Magakian 871, VDB 146, Bernes 40, V361 Cep. Asumming this is the correct description, VdB 146 is the reflection nebula surrounding V361 Cep (BD+65 1637), which is a Herbig Ae/Be star. Despite of the confusion, one can be told: this is a young compact star forming region which shows a colorful mixture of nebulosity and bright stars against the dust clouds of the Milky Way. The distance to the complex is believed to be 3300 light years. A lot of Herbig-Haro (HH) objects can be seen on the image (see mouseover for annotations). Herbig-Haro are small emission nebulae around young developing stars (protostars). First described by American astronomer George Herbig and Mexican astronomer Guillermo Haro during the mid-1940's while studying NGC 1999, they are believed to be transient phenomena that last less than a few thousand years. With its diameter of 7.5 arc-minutes, HH 167 in Cepheus is one of the largest examples of a Herbig-Haro object.